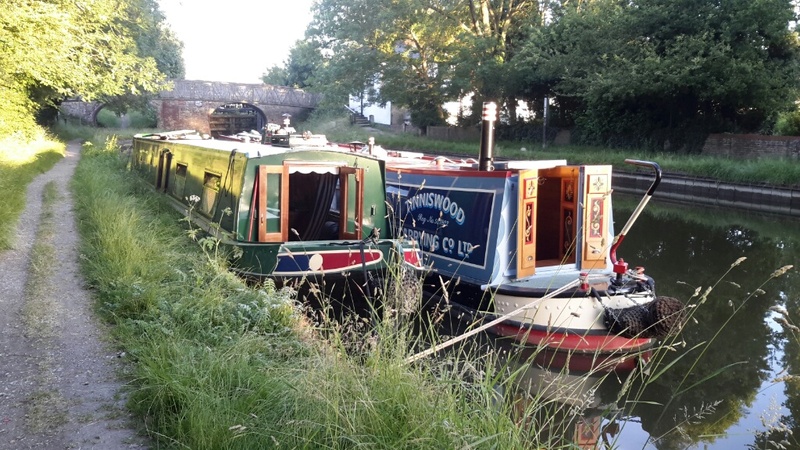 For the last few days we have been meeting up with boating friends old and new in Aylesbury. On Friday we started down the Aylesbury arm and at Wilstone we picked up Simon and Karen who had driven up from home in Gloucestershire. They helped crew us and Uncle Mort down the flight along with our daughter’s in-laws Richard & Anne who live nearby. We found a mooring in the basin and later other boating friends Roger, Margaret, Andrew and Wendy joined us. They were staying in local hotels. We all went for a pub meal later and were joined by Graham & Brenda who had driven from home. Saturday was spent by most of us going to Woddeson manor, a National Trust place nearby. The evening involved a meal at a local curry house. Sunday morning Roger, Simon and Karen helped crew us back up to Marsworth. We first moored just below the junction, later it was pointed out to us that this space was reserved for fishermen. So roped up back to front, i.e. Uncle Mort’s stern with our bow, we chugged up a few hundred yards to just below lock 39.